At least 23 people have been killed and dozens wounded in a gold rush in northern Guinea that has led to hundreds of shooting incidents, according to hospital and security sources. "Our services recorded 313 shootings from January 1 to June 30, in which about 20 people died and dozens of others were wounded," a senior state official said. State hospital sources in Siguiri, a town on the Niger river near the border with Mali, said on Friday that at least 23 people had been killed since the start of the year. "The number of casualties may be higher because some of the wounded are being treated in private clinics and there are also corpses which are still lying on the ground," the head of emergency services at the regional hospital, Balla Moussa Keita, told AFP. "The Siguiri region has abundant deposits of gold -- it is the most dangerous part of the country," the state official told AFP. The violence is due "not only to the riches beneath the soil, which attract gangsters, but also due to repeated clashes between villagers over land rights, as well as the influx of clandestine diggers from every neighbouring country," he added. "The villagers are armed, the clandestine arrivals are armed and the mining zones are over-crowded," he warned. Guinea has gold, diamonds, bauxite and prodigious reserves of iron ore. In Kouremale, about 100 kilometres (60 miles) from Siguiri, clashes erupted during a wedding procession by Malians in Guinean territory, leaving one person dead and numerous injured, according to the Guinean authorities. A violent dispute between gold diggers in November last year at the mining site of Niaouleni, another border area, left at least six dead. Neighbouring Mali has recently been affected by armed jihadist activity, while Liberia and Sierra Leone to the south both endured long civil wars that lasted into the early years of the 21st century and left the region awash with weapons. Specialist website Mining-Technology.com has reported "numerous clashes between the miner AngloGold Ashanti and some groups of artisanal miners who have been found operating beyond the traditional orpaillage (gold washing) system and therefore agreed areas". 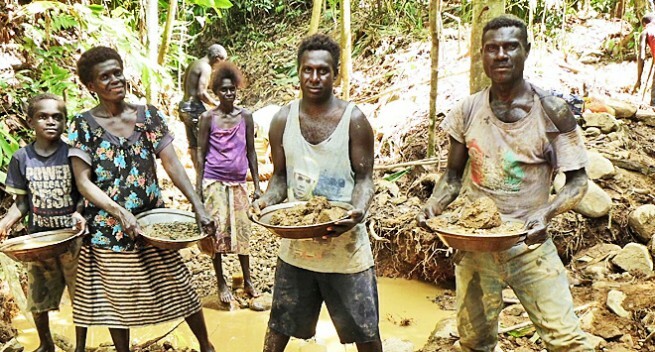 Artisanal miners from local villages have invaded company pits in large numbers when their own workings get flooded in the rainy season, the report added.